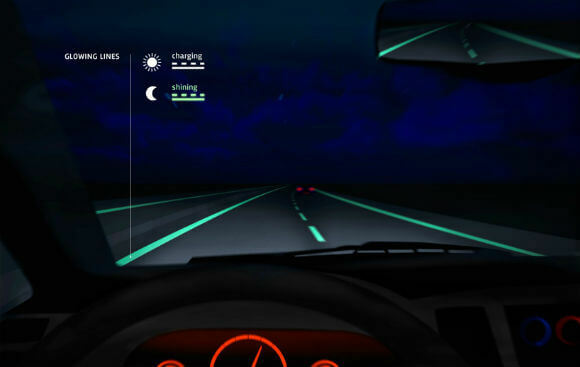 UPDATE: And Holland delivers – glow-in-the-dark highways are now a real thing! Transportation thoroughfares in the Netherlands are about to take a big leap into the 21st century. The Dutch design firm Studio Roosegaarde and Heijmans Infrastructure, a major European road construction company, will transform roads in southern Holland into smart highways beginning in the middle of next year. Over the next five years, features to be implemented will include glow-in-the-dark roads, paint that illuminate to warn of icy conditions, interactive and wind lighting, and an induction priority lane for electric cars, once the particulars of scale for that technology are worked out. With much of the focus on innovation in transportation aimed at automobiles, the Dutch designers opted to focus instead on the roads themselves. Their vision is to create a sort of “Route 66 of the Future” to save energy costs, make roads safer, and promote sustainability at the same time. Altogether the team has around 20 innovations to bring their full vision to fruition. The design was recently named a “Best Future Concept” at the Dutch Design Awards show in Eindhoven. One of the improvements the design team proposed was the use of dynamic paints. These are paints with thermochromatic pigments that only become visible at certain temperatures, such as the pigments used in the Hypercolor line of clothing. 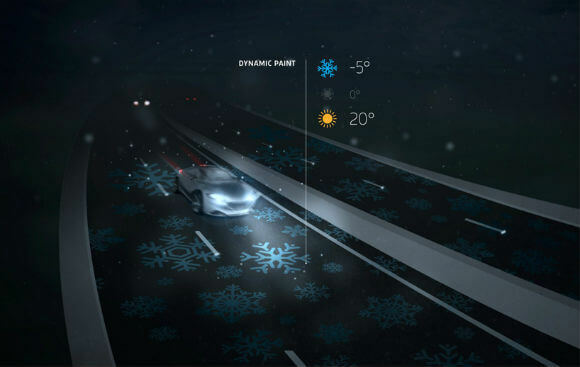 For smart highways, the paints would be used to become visible at low temperatures, so that snowflakes visible on the road would warn drivers of the icy conditions. Another improvement would be the use of glow-in-the-dark paints. The paints contain photoluminescent powders that charge up in sunlight throughout the day and stay illuminated for up to 10 hours throughout the night. These could be used in road markings, which could minimize the use of electrical lighting. 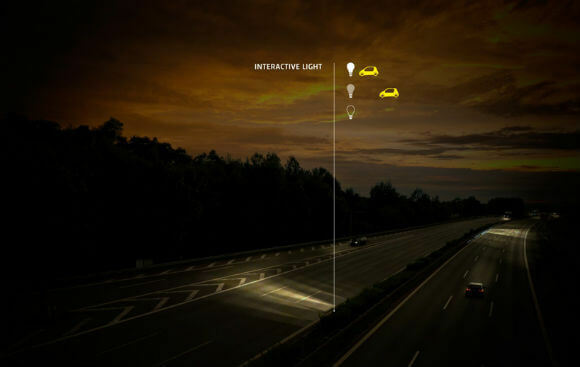 This could make roads safer as well for people who have difficulty driving at night due to bright lighting. And yes, it does look like Tron. Now the designers don’t propose to get rid of lighting altogether, but make its use more intelligent, as in when it’s needed instead of being illuminated all the time. How so? By a simple little innovation called motion-activated lighting. 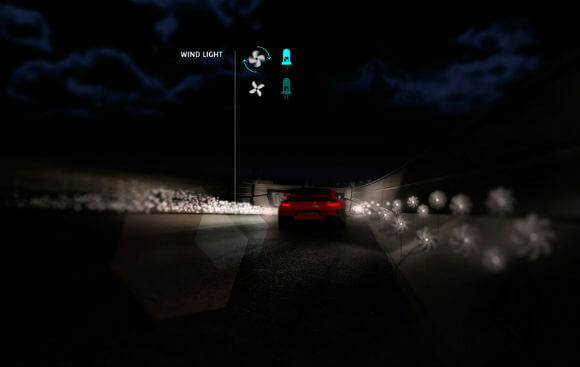 By turning on in front of a vehicle like a wave, the lighting would provide a constant illumination directly in front of the driver, sort of like an extra set of headlights. A more decorative idea is to use pinwheel lights that brighten when they spin, either from natural wind or when a car drives by. These are clearly more for aesthetics, although they could also serve as a way to indicate to drivers that cross winds are picking up. 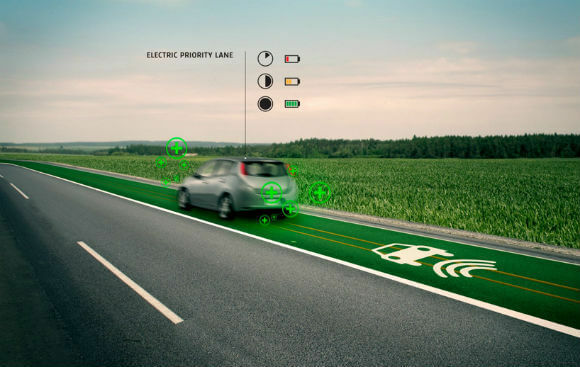 One long-term innovation is to make an electric car-only lane that creates a magnetic field in the road to inductively charge the battery as the car drives. This idea could be the thing that helps electric cars gain wider acceptance, even in the US which has seen slow adoption in the use of alternative fuel vehicles. Both the dynamic and glow-in-the-dark paints will be implemented starting next year. The plan is to roll out the other innovations before 2015.